Palu (Agenzia Fides) - "I am in Palu, I visited some places where the earthquake sowed great devastation", says to Agenzia Fides Father Andi Suparman, a Camillian missionary, who arrived on the island of Sulawesi on behalf of the Camillian Disaster Service International (see Fides 3/10/2018). "In some areas – he observes - in particular, Petobo and Jono, the devastating geological phenomenon causes, during earthquakes, the liquefaction of the soil, which takes away everything. Petobo is a village with over 700 families. The liquefaction of the soil caused the release of mud and water from the surface of the land, which devastated houses and properties. Some buildings and people were literally swallowed up by the ground. Today, Petobo is just like an old cemetery, where there is no trace left that gives the possibility to identify what is left". "Jono - continues Fr. Andi - is another place where houses, buildings and roads have been completely erased. Until today it was a plain but, following the accumulation of land due to liquefaction, it has turned into small hills and the roads are divided in two. Compared to Lombok, where I was in the first rescue operations, there is no comparison with the earthquake in Palu. 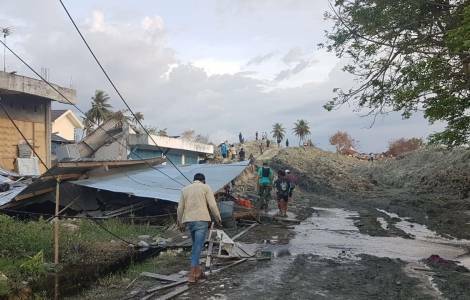 In Lombok, the survivors remained in the evacuation areas; temporary tents were built right next to their homes. And some have started rebuilding their homes on the original site. 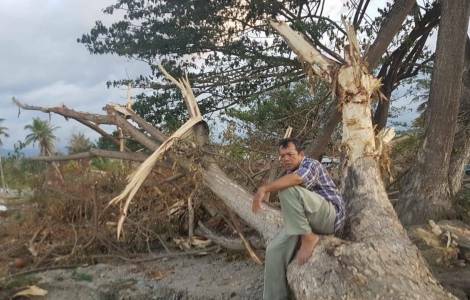 In Palu, however, many have been forced to move to safer places. People still live in panic because of the aftershocks". The Camillian notes that "there are few survivors. Many people, terrified, have left the region to move to other cities or islands. There are still volunteers looking for survivors. The city of Palu is still paralyzed. Shops are destroyed or closed. At the moment no activity has been open. Rescue goods arrive in Palu, after more than 12 hours of travel from other cities such as Makassar or Manado. I tried to reach the Camillians and tried to understand how to collaborate".